Creating websites by hand requires a lot of knowledge, effort and time. This is the case when you’re programming website by writing HTML/CSS/JS code. Nowadays coding is considered as counterproductive because anybody now can build a website just using a web design software, just drag-n-dropping site blocks and editing them inline. As the result, users get websites created that have the same or even better quality than manually coded sites and in doing so they save the extra time for improving the website content, SEO development or whatever else they have in mind. One of those best website builders is Mobirise website creation software. Mobirise does not only let you make appealing websites without coding but also doesn’t charge you for that. 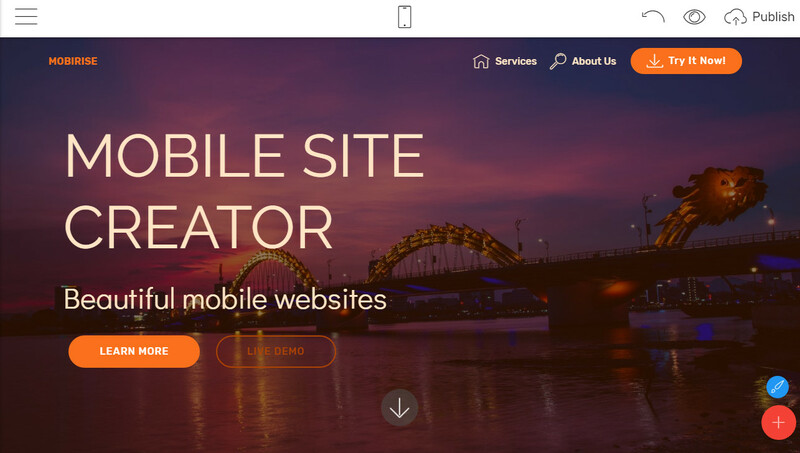 This software also allows for creating mobile websites that look on mobile devices as perfect as on desktop and you don’t have to tweak anything or create a separate mobile version of your site to achieve that. You don’t have to be a genius to cope with building super websites with Mobirise Free Website Builder. First of all, download the Mobirise desktop application for free and install it within a few seconds. Run the program and click on “create new site”. To make the first step, click on the red round button and drag so-called website blocks from the right sidebar direct on the page. The blocks will be placed on top of each other, so it will look like a one-page website that can be edited right in the application. Once you dragged the website sections, design them using settings of each block and a style panel for the whole website. Just like that, you will achieve a unique look of your pages in a few mouse clicks. Type or insert your text and embed your images and videos without efforts. This way you can build your own site that will stand out among others. Mobirise website creation software provides a set of Bootstrap website themes. The Bootstrap basis is what makes the website flexible and mobile-friendly. 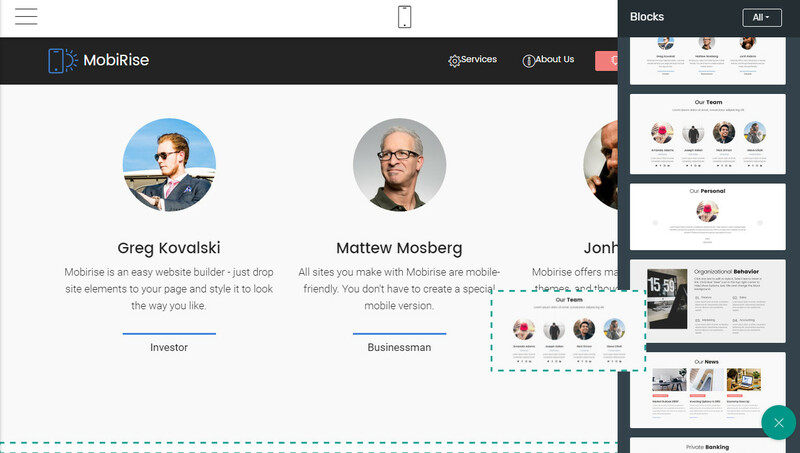 There are more or less 15 site templates available in the Mobirise web design application. Each theme has a different amount of website blocks. There are sections which are present in all of the themes but do not nearly look the same: menus, headers, footers, galleries, contact forms etc. Besides that, every theme has something special. AgencyM4 theme has semi-transparent gradient color overlays. 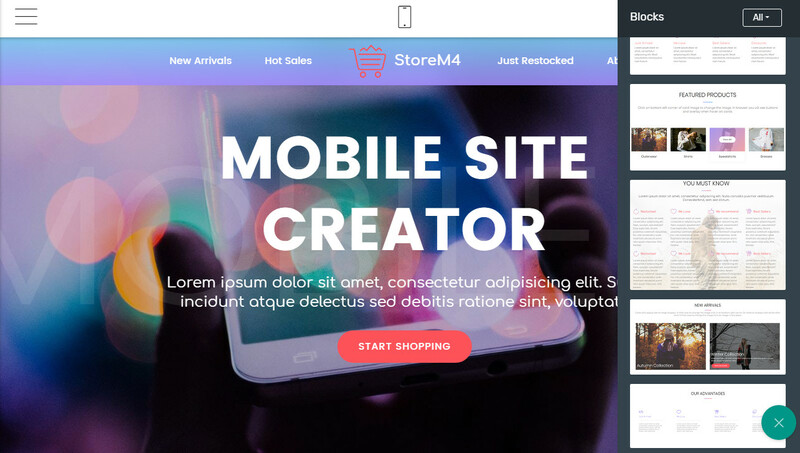 StoreM4 offers modern shop blocks with sidebars and price filters. With PortfolioM4 you’ll be able to create a header with a horizontal scrolling background image and a “typed” title animation effect. RestaurantM4 let you add unique restaurant menus with dishes titles and prices. Each website theme has its own style aiming to provide a seamless outstanding user experience. Even if every section is pre-built, you can easily change it and design as you want. We can’t call it a success when we have a good looking website, but it didn’t get ranked by search engines. The basic tenet of the SEO strategy is creating understandable, engaging and what’s more, unique website that warrants an unforgettable user experience. Mobirise Mobile website creation software allows you to build search engine friendly websites. Websites built with this software are fully responsive and display excellently on every device and Google loves sites like these. Mobirise also gives you more control over the activity of the search engine crawlers by providing the SEO extension with self-generated sitemap.xml and robots.txt files. The good news is that Mobirise Mobile Site Creator is fully free of charge. This makes the easy web design more accessible for everyone. If it doesn’t require any one-time or monthly payment, there’s no excuse not to try out this application. There are so many features and options for customization, so you won’t believe that it’s a free web creation software. If we go through the web in order to find some valuable comments about Mobirise Mobile Website Creator, we’ll find out that this application is used by people with every kind of web expertise: from novices to professional and experienced web developers. We can surely find some negative testimonials, but it’s the matter of taste. 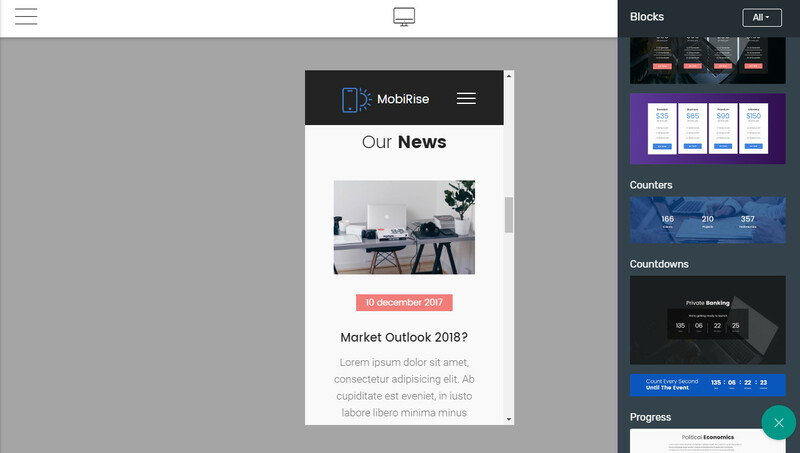 The majority of Mobirise users are completely satisfied, even excited and thankful for the opportunity to be able to build picture-perfect mobile-friendly websites for free. Download free web creation software Now!